After seven months of planning, hundreds of miles of walking, and countless YouTube video research sessions, we are finally heading to Peru in the morning. Are we ready? We’ll find out. Almost as daunting as the prospect of the hike itself was the packing. Let me start by saying I’m a list-maker. I actually have a Universal Packing List document stored in Google (nerd alert!). Over the years I have found this to be one of the ways to make sure you don’t forget something key, like a prescription medicine or your sunglasses. But this time around, the packing list has felt…well, complicated. Obviously there were some essential elements for the trek, like hiking boots, good socks, and comfortable pants. 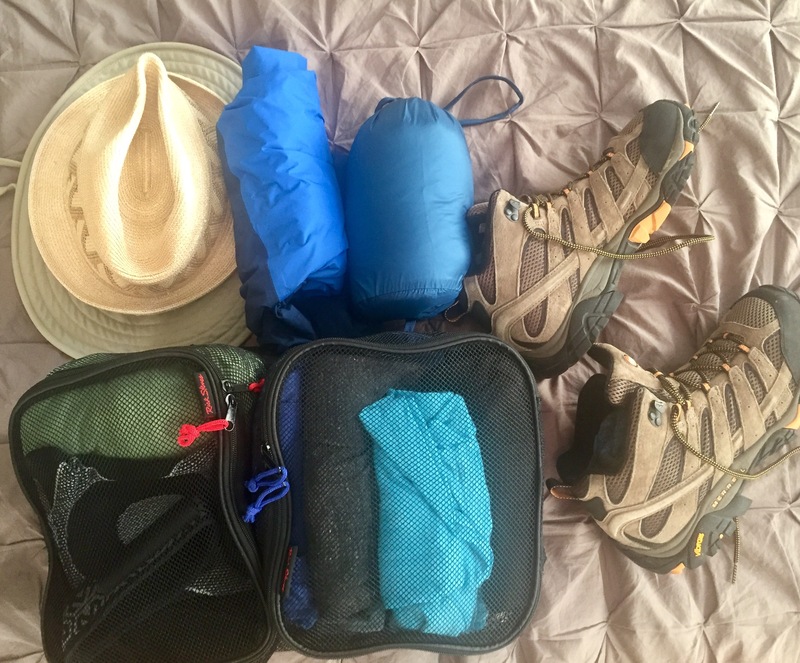 But because we’ll be hiking through multiple microclimates, with temps ranging from the 30s to the 80s, as well as the potential for rain, we also needed to consider rain gear, both sun and warm hats, gloves, fleece & other layers, and quick-dry everything. Oh, and water bottles, plus insect repellent and LOTS of sunscreen. Add to that the fact that we’ll have four nights total in Lima, a very cosmopolitan city right on the ocean, where we will want to go to a nice restaurant or two, and the packing list becomes more complex. And don’t forget reading material…very important! Those who know us know that we have, since 2003, been strictly carry-on only folks. Our trusty Rick Steves backpacks have seen us through 14 years of travel, including three weeks in India and Nepal. But this trip is testing the limits of what we can bring. Naturally, we could check our bigger RS backpacks…but the potential of the airline losing our main luggage, with everything we need to actually go on this trek we’ve done so much work towards, literally makes me queasy. So, back to the packing: in the end, we managed to fit everything we (think we) need into the bags we have. No room to spare, really, but we’re not big souvenir shoppers. We usually find one or two small items–handmade napkins, a table runner, a holiday ornament for the tree–that are easily packed into whatever small corner we have. In a couple of weeks we’ll see if we got the packing list right, or if we brought things we didn’t need, or left out things we did. We’ll let you know how we did!